Baking soda has become a staple in many households around the world. Not only can it be used for baking, but is also a great product to use to clean your home without resorting to using harsh chemicals. Baking soda is bicarbonate of sodium. Sodium bicarbonate, or baking soda, is a fantastic product for removing odors from around the house and several baking soda uses exist for cleaning without resorting to using toxic chemicals that can be harmful to your family. Along with being a great, chemical free cleaner for your home, baking soda is also used in baking and has numerous health benefits, from relieving heartburn and indigestion to removing pesky splinters. 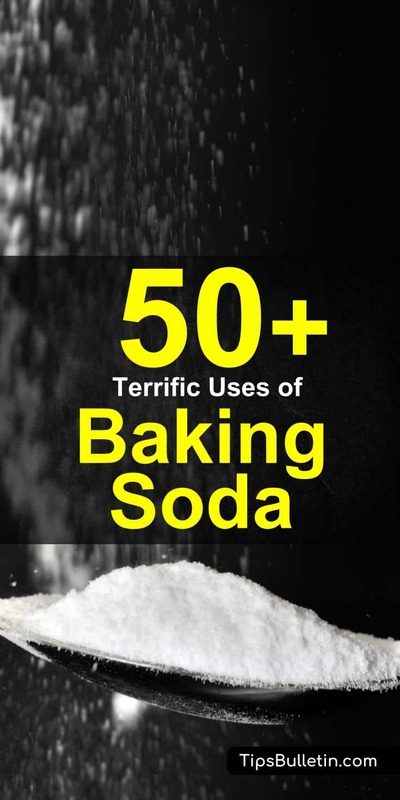 These many uses make baking soda one of the most useful products to have in your home. 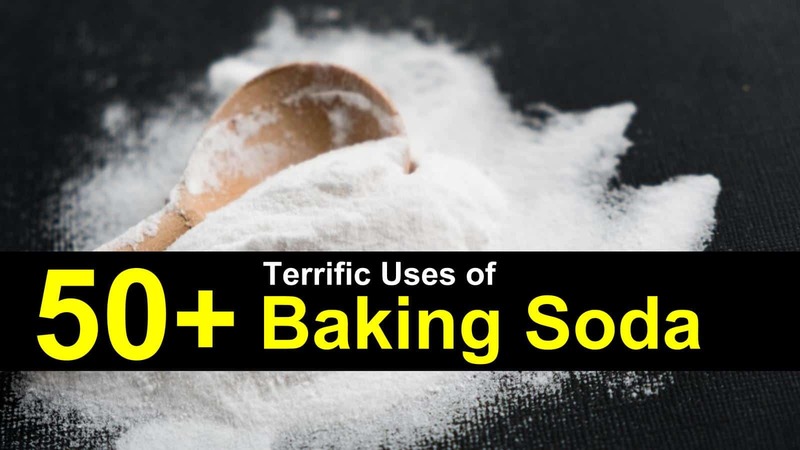 With more than 50 baking soda uses and baking soda benefits, it is an inexpensive alternative for everything from daily hygiene products, to household cleaners. In this article, we’re going to go over these uses and benefits. We’ll also cover how to tell if baking soda is fresh and the difference between baking soda vs. baking powder. What is the Difference Between Baking Soda vs. Baking Powder? Can I use Baking Soda in the Garden or for Plants and Vegetables? How Can You Tell if Baking Soda is Fresh? What Happens when Baking Soda and Vinegar are Combined? Since the early 1970s, many of the cleaning products that are used in homes today contain the harmful chemical triclosan, a pesticide that is known to be an antibacterial agent, that is found to decrease thyroid hormones when exposed to high doses. A safe and effective way to clean your bathtub, sink, and surrounding tile is by sprinkling a light layer of baking soda on a clean, damp sponge and scrubbing the tub as usual. Thoroughly rinse the bathtub and wipe it dry with a clean towel. Baking soda also works well to clean rust stains from a fiberglass bathtub and glossy tiles. For extra cleaning power, you can make a paste with the baking soda for a deep-down clean. To make the paste, mix the ingredients. Apply a thin layer to the area you want to clean and let sit for ten minutes. Scour with a clean sponge, and thoroughly rinse the tub. To help cut grease and remove food that remains on your pots, pans, and dishes, add two tablespoons baking soda, along with your liquid dish soap to your dishwater. Scrub the pots and pans and rinse thoroughly. If you have baked on foods, soak the pans for at least 10 minutes in the baking soda and detergent water. Next, pour some baking soda on a clean cloth or sponge and use as a scouring pan. Not only is this useful for removing baked-on food, but it won’t scratch your pans. After using your sponges for a while, they can begin to smell like mildew. Baking soda is perfect for eliminating the stale smell from overused sponges. To clean your sponges, mix four tablespoons of baking soda with a quart of warm water and allow the sponge to soak for several hours. Baking soda can gently clean your microwave without leaving a harsh chemical smell. 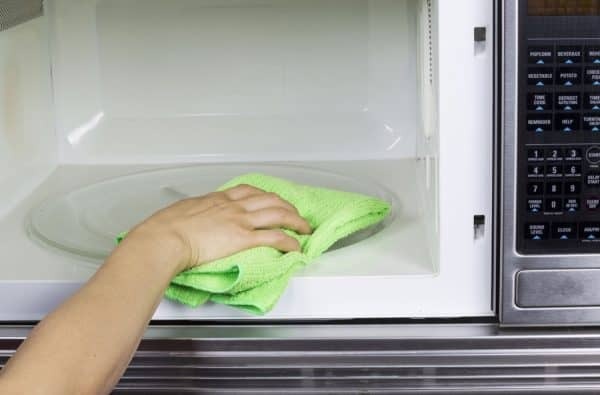 Apply some baking soda to a clean, damp sponge or microfiber rag and gently scrub the outside and inside of your microwave to remove stubborn, dry food residue. Be sure to rinse thoroughly with water to get rid of any leftover particles. Clean your silver flatware and dishes using baking soda. Create a paste that is three parts baking soda and one part water. With a clean cloth or sponge, rub the paste onto your silver. Thoroughly rinse off and allow to dry. Baking soda is an important part of our recipe for a homemade silver cleaner for jewelry. A simple mix of baking soda with distilled water will clean your iron plate. rub the paste directly on the iron plate and let it sink in for a couple of minutes. Wipe it clean with a paper towel. This simple baking soda cleaning paste is perfect for cleaning an iron. If your coffee pot or teapot has become stained, you can get it sparkling clean with a little baking soda. Wash your mugs and coffee pot in a solution of 1-quart warm water and ¼ cup baking soda. Not only will this help to remove stains, but will contribute to eliminating the bitter off-tastes left by the dried and burnt coffee residue. If you find the stains to be stubborn, you can soak them overnight in a solution of ¼ cup baking soda, one teaspoon dish detergent, and 1-quart warm water. Cleaning your floors is one of the many great baking soda uses. This heavy duty homemade floor cleaner will not only remove dirt and grime, but it will do it without leaving unwanted scratch marks on your no wax or tile floors. In a bucket of water mix the ingredients. Soak your mop with the mixture and clean your floors, allowing to air dry. If you need to get rid of scuff marks, you can use baking soda on a clean, damp sponge, to remove them from your floor. After scrubbing the marks with the sponge and baking soda, rinse the area and let it air dry. If you have a dirty oven full of baked-on food and you want to know how to clean an oven; baking soda is the perfect alternative for cleaning without the harsh chemicals found in commercial oven cleaning products. It makes the perfect DIY glass cleaner for your stovetop. Just sprinkle the baking soda in the bottom of the oven, and dampen it with a spray of water. Allow the baking soda to rest overnight, then scrub the area in the morning. Scoop out the residue with a vacuum or sponge, then rinse. Homemade natural oven cleaner recipe. After being used for several months, vinyl shower curtains in your bathroom can begin to grow mildew and tend to smell funny. You clean and deodorize the shower curtain by using a damp sponge and baking soda. Scrub the shower curtain thoroughly, then rinse clean and hang to dry. Make this part of your shower cleaning routine as this will keep your bathroom clean and disinfected. Additionally, it not only deodorizes curtains, but it also freshens up old laundry. Give your good old baseball cap a fresh start and sprinkle a bit of baking soda in the hat. You can add ½ cup baking soda to your laundry to make the liquid laundry detergent work harder. The baking soda gives the detergent a boost by balancing the pH in the wash to help get your clothes cleaner, brighter, and fresher. In addition, you can use an essential oil like lavender with baking soda and other ingredients to make a lovely homemade linen spray to freshen sheets and clothing. A baby’s skin requires the gentlest of cleansers. While there are more of these available commercially, the odor and stain fighters added to the detergents can be hard on a baby’s skin. 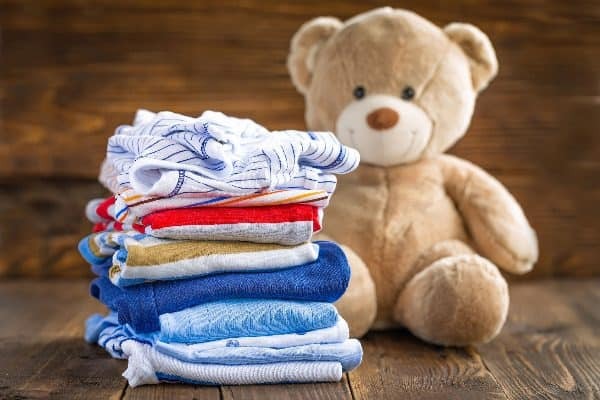 That is why adding baking soda is a great way to help remove odors when you wash baby clothes. You can add ½ cup baking soda to your liquid laundry detergent to treat tough stains without adding harsh chemicals. To deodorize the clothing, add ½ cup of baking soda to the rinse cycle. To neutralize the acidic odors associated with cloth diapers and remove acid and protein-based stains, dissolve a ½ cup of baking soda in two-quarts warm water and let soak. You can also add baking soda to the bottom of your diaper pail before you begin to fill it with dirty diapers to keep the pail smelling fresh. You can clean and deodorize smelly sports gear by using a mixture of four tablespoons baking soda and one-quart warm water. Soak a sponge in the mixture and wipe down any equipment that has begun to smell. Sprinkling baking soda into your gym bag will also to help neutralize sweat odors. If you find that your car has an oil leak, it can leave ugly stains on your garage floor and driveway. Baking soda can help you to get rid of these oil stains of your clothes, leaving the area looking brand new. Just sprinkle baking soda on the spot you want to remove and scrub it with a wet brush. You can use baking soda to neutralize battery acid corrosion on your lawnmower, car, kids’ electronic toys, and anything that requires a battery. Form a thick paste by mixing the ingredients thoroughly. Disconnect the terminals before you start to clean the battery. Place the baking soda paste on a damp cloth and scrub the corrosion that has formed on the battery terminal. To prevent further corrosion, wipe the terminals with petroleum jelly after you have reconnected the terminals to the battery. Use caution when working with batteries because they contain acid that can burn you. A simple way to remove road grime, tree sap, tar, and bugs from your vehicle’s exterior, try using baking soda. You can clean your car windows, car lights, chrome, vinyl seats, tires, and floor mats with a quart of water and ¼ cup baking soda. Plus, you don’t have to worry about leaving unsightly scratches. To remove stubborn stains, sprinkle some baking soda on a soft brush or damp sponge and scrub the stain. You can clean your kitchen counters and sink without using harsh chemicals or leaving a toxic residue. Sprinkle some baking soda on your kitchen surfaces and scrub them down with a clean rag or sponge. You can also add lavender, lemon, or peppermint essential oil to create a natural healing scent to the homemade cleaning product. Many of the commercial carpet cleaners on the market today contain harsh chemicals that can be harmful to your children and pets. Using baking soda to clean your carpet and to get rid of urine smell not only helps to remove dirt and odors from the area, but it is safe to use around your pets and children. This recipe also works really well if you are not sure how to get cat urine smell out carpet. Just sprinkle your carpet with baking soda, let it sit for 20 minutes, then vacuum up. You can also remove tough stains with this simple do-it-yourself baking soda recipe. Use the vinegar and water in a spray bottle. Shake the bottle well to ensure the ingredients are thoroughly mixed. Cover the stains in your carpet with a layer of baking soda. Spray the area down with the vinegar/water mixture. Allow the ingredients to sit for several hours. With a small brush, scrub the area to loosen the paste. Vacuum the floor and celebrate the removal of the stains. Find more tips and recipes to get blood stains out of carpet here. If you’ve noticed your fridge smells a bit off lately, you may want to consider placing an open box or container of baking soda in it to help eliminate the stench. Baking soda can absorb odor molecules from the air, to help neutralize the odors that can collect in your refrigerator. Baking soda is a wonderful natural drain cleaner. It is perfect to unclog any drain without much effort. You can use baking soda mixed with apple cider vinegar to clean your pipes. Unlike the harsh drain cleaners that you can find at your local supermarket, this is a safe alternative for removing clogs. Empty a box of baking soda into your drain, then pour in some apple cider vinegar. Let the mixture bubble for 15 to 20 minutes, then run hot water down the drain. As an added benefit, baking soda is perfect for cleaning a garbage disposal, too. Food debris and odors are removed instantly! To remove baked-on food and eliminate unwanted grease from your dishes and pans, add some baking soda to the regular cycle on your dishwasher. The baking soda reacts with the water to help remove grease and grime that tends to build on your pans and dishes. 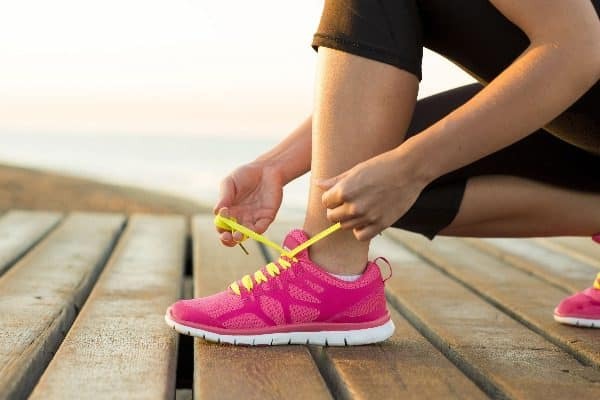 If you are having trouble getting the strong odors out of your smelly shoes or sneakers, try baking soda. It not only works great to remove stains from leather shoes, you can also use it to deodorize your boots. Perfect to get those old dirty vans clean and fresh again. Just place some baking soda into the bottom of your shoes, and within minutes they will smell clean and fresh. If your closet smells musty and dirty, you can freshen it up with some baking soda. Like with the refrigerator, placing a box or cup of baking soda in your closet will help to eliminate odors and keep your closet, and your clothes smelling fresh. Cat boxes tend to stink, no matter how often you clean them. To help keep it smelling as fresh as possible between cleanings, add some baking soda to the bottom of the cat box before you add in the litter. After you clean the liter out, sprinkle baking soda on top to give it a quick refresher, then thoroughly clean out the box and add a new layer to the bottom every couple of weeks to keep odors at bay. If you use wood cutting boards in the kitchen, you know how quickly they can begin to smell. The wood tends to absorb food odors, which can be difficult to eliminate. To get rid of old food odors, sprinkle the cutting board with the baking soda, scrub it thoroughly and rinse with warm water. Trashcans, both indoor ones, and outside ones can get pretty stinky. Sprinkling baking soda in the bottom of your trashcans can help to neutralize odors and keep those stinky smells at bay. Dishwashers can quickly begin to smell of mildew. To clean and deodorize the dishwasher you can sprinkle baking soda on the inside of the machine before you run it through a cycle. It is part of most homemade dishwasher cleaner recipes and also works as a gentle cleanser on your dishes when used with your regular dish detergent. With all the leftover food that gets put down the garbage disposal, it’s no wonder it can take on a pretty disgusting smell. Baking soda is an excellent way to deodorize it and keep food odors from lingering and resurfacing. While running warm tap water, pour some baking soda down the drain to neutralize basic odors and acid, leaving you a fresh smelling drain. The plastic lunch boxes your kids take to school are great at absorbing the food odors from their lunches. After several weeks of use, they begin to smell, and no matter how often you wash them out, the odors linger. To get rid of these lingering odors, place a small, spill-proof box of baking soda in their lunch boxes between uses to keep odors at bay. Carpets can start to smell after a couple of months, even quicker if you have pets and children in your home. As we mention in our recipes for homemade carpet shampoo, to quickly get rid of carpet odors, liberally sprinkle baking soda over your carpet. Let it sit overnight. In the morning, use your vacuum to pick up the baking soda and enjoy your odor free carpeting. The same recipe works great as natural car upholstery cleaner and when you clean a mattress. Just sprinkle some baking soda over your mattress, rub it in with a towel and vacuum your mattress after an hour. You will be amazed by the refreshed smell of your old mattress. Baking soda is a fantastic tool for cleaning around the house and removing stubborn stains and odors, but there are many ways baking soda benefits your health as well. Here are some of the most common benefits of using baking soda to enhance your everyday health. For women, it is recommended you use lavender, sage, and lemon. For men, use bergamot, rosemary, and cypress. You can make natural deodorant with baking soda, which is an easy way to combat body odor without subjecting your body to the harsh chemicals found in most commercial deodorants. If you want to prevent wetness, add some cornstarch to the recipe. To make a natural deodorant, place the coconut oil in a small bowl. Add the baking soda and mix well. Combine the essential oils of your choice and stir the ingredients. Put the paste in an empty deodorant container or glass jar. Baking soda is ideal for removing dry skin from your face. You can create your own exfoliate by combining one teaspoon baking soda with half a cup of water. Using a circular motion, rub the paste into your face, then rinse with cold water. Baking soda also works to soften hands, while removing dirt and odors. Just mix two tablespoons baking soda with ½ cup warm water and rub it into your hands. The natural scrub works also really well to get hair dye off your skin and will leave your hands free of dirt and soft, without the toxic chemicals. You can create a chemical-free foot bath to soak tired feet by combining a tablespoon of baking soda with warm water. The baking soda will work to remove odors and the odor-causing bacteria. Soaking your feet in a baking soda foot bath will also help to prevent toenail fungus from forming. Applying a baking soda paste to the irritated skin will contribute to reducing the discomfort associated with sunburn and allergic rashes. It can also soothe skin irritation caused by poison oak and poison ivy. Just mix a teaspoon of baking soda with some water and apply to the affected skin. If you’ve ever gotten a splinter, they can be difficult to remove. If left too long, you risk the area getting infected. Baking soda can help you remove splinters naturally. Mix a tablespoon of baking soda with warm water and soak the affected area at least twice a day. After a few days of this, your body will expel the splinter naturally. 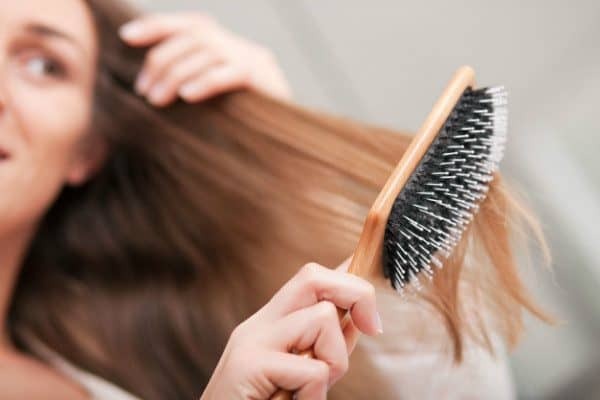 Your hair brushes and combs will hold onto the harmful chemicals found in the hair products that you use. You can use baking soda to clean hair brushes, removing the hair product residue deposited on your comb and brush after every use. To clean your brushes, mix two teaspoons baking soda with one cup of water, and rub the compound into your brush and comb, then rinse. This detangling effect of baking soda makes it an excellent wig cleaner. Dilute it in warm water and it washes the wig thoroughly. The hair products that we use tend to leave a harsh residue, even after washing. To get rid of this residue and remove the dirt and oil that can accumulate over time, add a teaspoon of baking soda to your shampoo and rub it in your hair. Additionally, mix three part of hair conditioner with one part of baking soda and you get the perfect home remedy for lice. Simple and easy-to-make, yet very effective. Extra hair tip: Use baking soda and dish detergent to wash your skin after you dye your hair. Works really well. While baking soda works exceptionally well to get rid of bed bugs, it is also perfect for pain relief after you got bitten. If you’ve ever suffered from a bug bite, you know how much they can itch. Rubbing some baking soda on the affected area can relieve the itching. When you first realize you have a bug bite, create a baking soda paste by combining water and one teaspoon baking soda. Apply at least three times a day until the bite disappears. Baking soda can take the sting and heat out of a sunburn. To get the full benefit, add ½ a cup of baking soda to your warm bath and soak in it for about thirty minutes. Adding some baking soda to your favorite lotion will allow you to continue the relief after the bath. To remove more plaque from your teeth when cleaning, add some baking soda to your toothpaste. Baking soda is known to increase the amount of plaque you remove when you brush your teeth. You can purchase toothpaste that already has baking soda as an ingredient, or a few times a week; you can dip your toothbrush in baking soda to increase the amount of plaque you remove from your teeth. Baking soda can also help to whiten your teeth. Create a paste by mixing one teaspoon baking soda with some warm water. Once a week apply the baking soda paste to your teeth and let sit for about five minutes, then rinse with warm water. If you want to get rid of bad breath, you can use baking soda to freshen your mouth. Unlike commercial breath fresheners, baking soda will neutralize the odors that cause the bad breath instead of only covering it up. To use, place one teaspoon baking soda in a glass of water. Swish the mixture in your mouth for one minute, spit it out, then rinse. Baking soda is also great to speed up the healing of canker sore. Mixed with warm water it cleans and helps the healing process. Dentures, and other oral applications like mouthpieces and retainers, can get pretty nasty if you don’t care for them properly. To loosen stuck on food particles and neutralize odors, make a homemade denture cleaner by mixing two teaspoons baking soda in a small bowl of water, and allow the appliance to soak for thirty minutes. Baking soda has numerous health benefits, including using baking soda for heartburn. Baking soda is an excellent antacid because the bicarbonate helps to neutralize the stomach acid that causes indigestion. Add half a teaspoon baking soda to two cups of water. Drink the water an hour after eating to find relief from heartburn. A study conducted by the University of Arizona’s Biomedical Engineering Department has found that drinking baking soda can reduce or eliminate the metastases, or spread, of breast cancer to other parts of the body. Baking soda has the power to absorb the lactic acid that tends to build up in your muscles during your workouts. Removing lactic acid from your muscles helps to delay fatigue and enhance your performance. Simply add a teaspoon of baking soda to your water and drink it before you begin your workout. When your kidneys aren’t working right, your body can have a hard time ridding itself of acid. Consuming baking soda can help to improve kidney function because it is alkaline and buffers the acid in your body, helping to keep your pH levels balanced. Baking soda works to neutralize the acid in your stomach, which can help relieve the pain associated with ulcers. To help relieve symptoms, place 1 – 2 teaspoons of baking soda into a glass of water and drink it whenever your ulcer becomes painful. An alkaline compound, baking soda will produce carbon dioxide gas when combined with an acid. When used in cooking, the small bubbles that are generated by the carbon dioxide become trapped in the batter, causing the dough to inflate and rise. The most common acids that are combined with baking soda to produce this reaction are lemon juice, vinegar, yogurt, buttermilk, and cream of tartar. Baking Soda: How does it work? You can also produce carbon dioxide gas in baking soda by exposing it to heat. The chemical reaction doesn’t need an acid to take place; you just need to expose the baking soda to temperatures above 176 degrees Fahrenheit or 80 degrees Celsius. 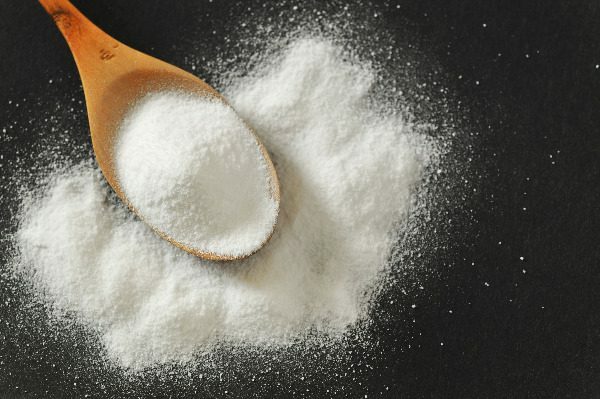 The difference between baking soda vs. baking powder has to do with acidity. Baking soda is strictly an alkaline compound that needs to be combined with an acid to create the carbon dioxide gas. Baking powder is a bicarbonate that contains an acid already. Baking soda works excellently around plants. It is a natural booster and stimulates blooming. Baking Soda works also great to test garden soil and to reduce acid levels. That’s why baking soda makes for much sweeter tomatoes. In addition, it prevents any fungal diseases on plants and if sprinkled around, kills even slugs. Diluted in water and mixed with olive oil, baking soda also makes for a great spray to kill spider mites and aphids. All around there are many amazing uses of baking soda in the garden. Make sure you use it around your plants and vegetables. Baking soda can begin to break down and decompose over time. You can test the strength of the baking soda by adding a small amount of baking soda to a large bowl and pouring a small amount of vinegar over baking soda. If the mixture foams vigorously, the baking soda is still good. Make sure you perform this test over the sink, as it can create lots of foam. If you are in the kitchen cooking and find that you don’t have the baking soda that is needed, you can always use baking powder as a substitute. Baking powder contains a small amount of baking soda, so you have to triple the amount called for in the recipe. When you combine baking soda with vinegar, you end up with a fizzing reaction. You get this response because the acetic acid in the vinegar reacts with the sodium bicarbonate, resulting in sodium acetate, water, and carbon dioxide gas, which forms bubbles. The bubbles are a result of the carbon dioxide escaping the water and sodium acetate solution. There are numerous benefits that make baking soda a marvelous product that you can for a variety of tasks around the house. Along with using it to make your bread rise, you can use it in numerous ways to clean around your house and has some pretty substantial health benefits. We’ve shown you more than fifty baking soda uses around your home and baking soda benefits to improve your health. We’ve also covered how to tell if baking soda is fresh, and the difference between baking soda vs. baking powder. We hope you found this article helpful and urge you to share this information with everyone you know.